October 18, 2013, 2:18 PM · "Thrills by Day, Chills By Night" is the motto for Great America's annual Fright Fest. This year I was able to go on a Saturday in which they were open from 11am to 11pm. I will walk you through a few of the highlights and give an overview of how Six Flags does Halloween. As mentioned, the park does stay open pretty late so if you get there right at 11am, you will be disappointed in seeing no monsters. This is the "family time" in which kids can trick or treat with Bugs Bunny and the gang and experience the rides, sans creepy characters. All the rides (except water) were running and it seemed to be a pretty full day. Some of the rides also have taken on their Halloween alter egos with Chubusco (teacups) turning into a demonic rave with lighting and smoke affects. The other major transformation is the Rue Le Dodge (bumper cars) into a dark light bumper car experience. It also rained during this time so we tried JB's Sports BBQ for lunch. It pretty much is the old Crazy Buffalo Saloon with a sports makeover. While the food is not cheap, it does appear to be better than the rest. They have buffalo wings, burgers, and pulled pork sandwiches. There is also a full bar so while its ok, it stands miles over the rest of Great America's food. When 4pm rolls around, it is monster time. Great America has a parade that "introduces" us to all our new Halloween friends from the various areas of the parks. These would include Scarecrows, Clowns, Pirates, and corpses. I was actually very impressed with some of the makeup this year, especially with the Seven Sins Cemetery corpses. They were themed to the Southern dead have risen. There were Southern Belles and even some Confederate Generals. Even though we are far north of the Mason Dixon line, I found that a bit provocative. Great America did create one more haunted experience/house this year which brought their total to six. They were The Abyss (Sea Themed), Total Darkness (house completely in the dark), Wicked Woods (Zombie infestation), Manslaughter Manor (Poltergeist), Massacre Medical Center (Hospital),and the Mausoleum of Terror (Graveyard). This year, they required guest to purchase wristbands for $20 which would give you unlimited access to the houses. For $30, you can get one to skip the line. We started the day with the $20, but found out that it was going to take too long so I got the $30 for our group hallway though. One of the more interesting houses was Total Darkness which was, well, in total darkness. "What?" you might say…. It was a pretty small house that was pitch black and you simply walked though mostly straight and stuff would brush your face (cobwebs, rubber bats, etc). 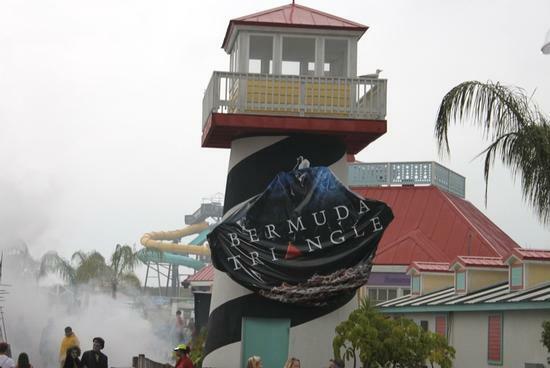 It was also in the Hurricane Harbor Water Park Section, turning it into the Bermuda Triangle. I still think Massacre Medical Center is the best done with costume, effects, and that a house can still be scary with lighting. We only saw one show this year, but was the most popular: Love at First Fright. It tells the story of two teens on a dare in the graveyard when they are kidnapped by a witch and her team of monsters (Frankenstein, Dracula, Wolfman, etc). It is performed as a musical show using popular Halloween songs (Monster Mash, Time Warp) and a few other classics (Devil with a Blue Dress, Love Potion Number 9, etc). It also has many topical jokes including Miley Cyrus and the Harlem Shake. I believe this show is performed at other Six Flags parks as well. The night ended with a show and parade to say goodbye to our new friends. 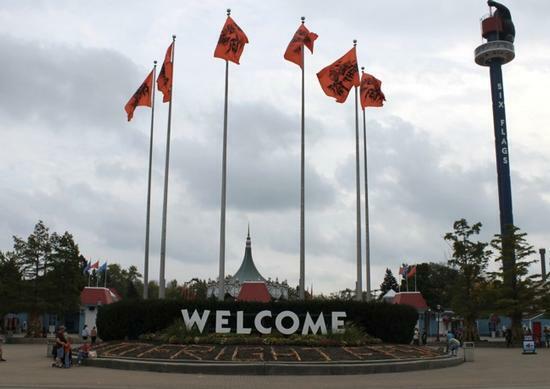 If you happen to be in the Chicagoland area and are looking for some coasters and some scares, come up to Gurnee and experience Six Flags Great America's Fright Fest. 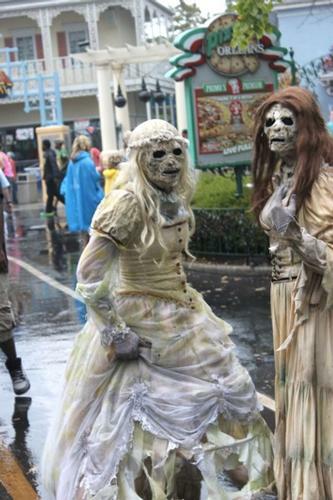 October 18, 2013 at 3:05 PM · I'm surprised to hear that guests are charged extra to do the haunted areas. I thought it was a bit tacky for Cedar Point to charge an upcharge for the "Dinosaurs Alive" area for a children's trick-or-treat experience. All the other haunted areas are free (but there is a Fright Lane option upcharge available). Where there complaints about having to pay extra for the haunted areas? BTW, you might be lucky that it rained. Saturday at Cedar Point was "a perfect storm". Perfect weather, extended hours, the most popular weekend for HalloWeekends of the year. It turned out to be the busiest day of the entire 2013 season, and the traffic congestion was terrible. Many complained of waiting 3 hours to leave the parking lot at the end of the day. Cedar Point is making major changes in their traffic procedures to prevent this from happening in the future. October 18, 2013 at 4:13 PM · Full Disclosure, I actually went to Fright Fest two Saturdays in a row. The first Saturday was to take my camera and take pictures, the second was to actually experience the rides. I brought my big fancy camera. That first Saturday it POURED. However, I found out that all the characters have little shelters where you can take pictures with them. The second Saturday was a slight drizzel which we timed out with lunch. Great America only charges for the haunted houses/trail. The scare zones are free. They have always charged (as long as I can remember). It actually used be be much more expensive. Another interesting touch was the Wicked Woods took place in the drained out Roaring Rapids. October 18, 2013 at 5:18 PM · I've visited Six Flags Over Georgia once already during the Fright Fest and I'll visit next weekend again. A trip report should come soon. October 20, 2013 at 4:23 PM · No mention of two hours of wait time to get on major rides?